Stunning 5BR/2.5FB Kettler Brothers built colonial surrounded by mature trees situated on a professionally manicured lot. This home features over 3,500 square feet of comfortable living space on three levels including: a great sense of light and spaciousness with designer home appeal, updated flooring. custom painting, replacement vinyl windows and lighting throughout; inviting foyer with Porcelanosa tile flooring, family room with brick wood-burning fireplace and cost-efficient LED recessed lighting; REMODELED gourmet maple, granite, and stainless kitchen with center island that opens to breakfast room with sliding glass door to screened-in porch and deck; formal living room leads into dining room with bay window and NEW neutral carpeting; spacious master bedroom suite with adjacent bedroom #2 or sitting room and walk-in closet; professionally RENOVATED luxury spa-like master bath featuring frameless walk-in shower with stacked stone wall and rainfall showerhead, designer tile flooring and dual vanities with quartz countertops; three additional bedrooms on the same upper level with NEW neutral carpeting, custom built-in closets and ceramic tile full bath; unfinished lower level perfect for ample storage and ready to be finished; Fully fenced-in backyard featuring gorgeous screened-in porch with vaulted ceilings/skylights and separate deck area perfect for entertaining. Neighborhood amenities are easily accessible from rear backyard gate that connects directly to walking trails and paths leading to pools, basketball and tennis courts, baseball field, picturesque parks and lakes. Expanded 5BR/2FB/1HBA split level with rear addition situated on a gorgeous lot with mature landscaping, driveway and sidewalk lined streets. This home boasts approximately 2,300 square feet of living area on three levels including a great sense of light and spaciousness with designer home appeal. Special features include family/breakfast room addition, custom painting, hardwood flooring, updated lighting and custom window treatments throughout; formal living room with box/bay window, recessed lighting and hardwood flooring; separate dining area with hardwood flooring; morning room addition with vaulted ceiling and NEWER slider to back brick patio and yard; spacious eat-in kitchen with ceramic tile flooring, ample cabinetry and designer tile backsplash; breakfast room addition with NEW carpeting, NEWER garden window, vaulted ceiling with skylight, pantry with overhead storage and side access to yard; master bedroom suite with hardwood flooring and walk-in closet with Elfa shelving; updated master bath with ceramic tile flooring and walk-in shower; three additional bedrooms on upper level with hardwood flooring and updated ceramic tile full bath with skylight; lower level features family room with NEWcarpeting, wall-to-wall brick gas fireplace, 5th bedroom, half bath, utility/laundry area with NEW flooring and enormous crawl space area for additional storage; fully fenced-in flat backyard with expansive brick patio and walkways, shed and fish pond perfect for entertaining and relaxing. Ideally located near shopping and commuter routes. 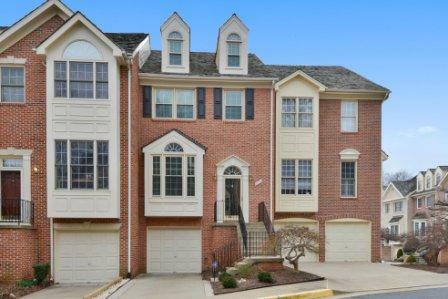 Dramatic 3BR/3.5BA, two-car attached garage townhouse on quiet side street. Stanley Martin model with approx. 2650 sq. ft. of living area on three levels. Special features include: 9-ft. ceilings on main and lower levels, gleaming hardwood floors, designer ceramic tile baths, custom built-ins, elegant mouldings and upgraded lighting throughout. Partial two-story foyer entrance with hardwood floors opens to recreation room with 9-ft. ceiling, full ceramic tile bath, mudroom, separate storage room with built-in cabinets, and garage access; hardwood staircase with oak railings and wrought-iron balusters; grand formal living room with corner-set gas marble fireplace, recessed lighting, and built-in bookshelf; gourmet kitchen with 42-inch cherry cabinets, granite countertops, ceramic tile backsplash, upgraded stainless appliances, center island/breakfast bar and walk-in pantry closet; dining room off of kitchen with sliding glass door to rear deck; master bedroom suite with tray ceiling, sitting area, and walk-in closets with cherry built-ins; designer ceramic tiled master bath with dual cherry vanities, corner soaking tub and separate shower. Right in the heart of everything that King Farm has to offer...only a few blocks to the community pool and Mattie J.T. Stepanek Park, a few blocks to King Farm Village Center shopping, and steps to courtesy King Farm shuttle stop to Shady Grove Metro. Rare to market M/I Homes Bell Haven model on a PREMIUM fully-fenced lot in King Farm just 1/2 block from the community center, pool, KF Metro shuttle bus stop, and school bus stop. This 5BR/4.5BA colonial features about 4,700 square feet of living area on three levels with all bedrooms on the upper level. Special features include: a great sense of light and spaciousness with 9-ft ceilings; model home décor with custom painting, hardwood floors on entire main level, ceramic tile floors in all baths, and custom blinds throughout; foyer entrance with open staircase; formal dining room and living room with gas fireplace opening to family room separated by decorative columns; gourmet kitchen with Corian countertops, island cooktop/breakfast bar and breakfast room which opens into the adjacent family room; master bedroom suite with lavish walk-in granite closet; luxurious ceramic tiled master bath with dual vanities, whirlpool tub and separate shower with glass enclosure and bench seat; four additional bedrooms all on the same upper level including a bonus teen/au-pair/in-law bedroom suite room over the attached garage accessed by private staircase off of the kitchen; fully finished lower level featuring a recreation room, den/exercise room; 4th full bathroom, and an art/storage room with vinyl tile floor and built-in shelving. Fully-fenced rear yard, professional landscaping and extraordinary two-tiered flagstone patio with curved stone retaining walls and landscape lighting. 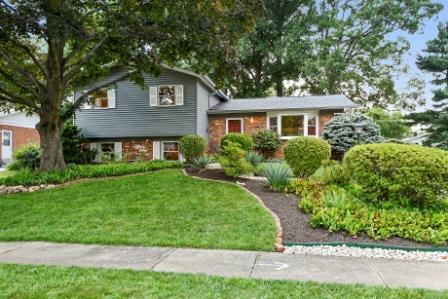 The owner of this home has meticulously maintained and improved the home as well as the landscape to offer you what is consider to be “the best of the best” in King Farm. 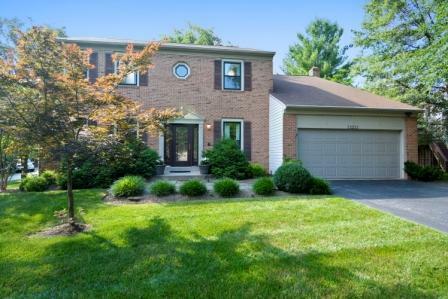 Expansive 4BR/3FB/1HB four level split with attached two-car garage located in desirable Highlands of Landis Spring. This home spans approximately 3,800 sq. ft. and is situated on a beautiful flat 1.03 acre lot. Special features include: NEW custom painting and neutral carpeting throughout, replacement vinyl windows and sunroom; Inviting foyer entrance leading into living room with hardwood flooring; formal living room with bay window and NEW carpet; kitchen with oak cabinetry and stainless steel appliances; separate dining area with hardwood flooring and French door access to sunroom; sunroom with cathedral ceilings and walls-to-wall sliding glass doors leading to patio and backyard; laundry/mudroom with powder room off of garage and back door to yard; spacious master bedroom suite with NEW carpet, walk-in closet and ceramic tile master bath; two additional bedrooms on upper level with NEWcarpet and full ceramic tile bath; full-daylight walk-out lower level family room with NEW carpeting and gas fireplace with brick hearth and surround, fourth bedroom with NEW carpet and two double-door closets and adjacent second full bath; BONUS fourth level with ample storage and access to utilities/systems. Sit back and relax and entertain on your patio or sunroom overlooking your gorgeous backyard with views of the mountains. Other features include NEW hot water heater; NEWER roof in 2011, NEWER well-pump (2015), and replacement vinyl windows. Conveniently located off of Old National Pike (Alt 40) and easy access to I-70 and I-81. 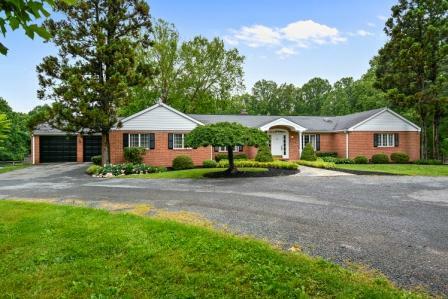 Spacious and open all-brick 3BR/3BA rambler on gorgeous private five acre lot in Ashton with complete equestrian facilities. 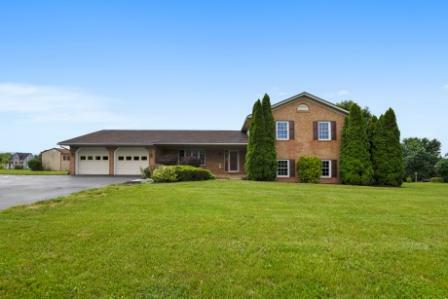 This home boasts over 3,800 square feet of living area above grade plus a partial basement. Special features include gleaming oak hardwood flooring throughout, neutral custom panting, detailed moulding, recessed lighting, and multiple skylights. Foyer entry vestibule leads into formal living room and dining room separated by decorative columns; kitchen with breakfast room leads into glorious sunroom addition; great room addition with barreled ceiling and gas FP; spacious master bedroom suite with sitting room, walk-in closets with built-ins, and ceramic tile master bath; en suite second bedroom on main level with full bath; private third bedroom with separate family room, third full bath and side entrance from driveway; mudroom and walk-in pantry closet; lower level storage room with full windows; two-car garage with built-in storage and attic pull-down stairs; brick patio off of sunroom overlooking pasture, two paddocks, and 4-stall barn with tack room, wash bay and hayloft; all systems throughout the house replaced in 2008 including two zones of heating and cooling; propane fueled Cummings whole house generator installed in 2014. 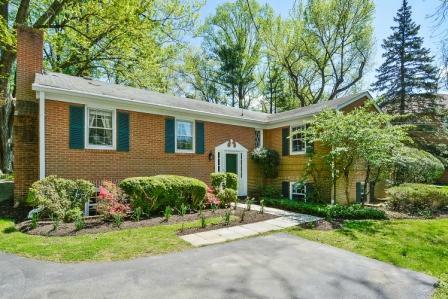 Charming 3BR/2.5BA all-brick split foyer on private lot in Bethesda with mature landscaping only a few houses away from Wildwood Manor Pool. This home boasts over 3,100 square feet of living area on two levels. Special features include oak hardwood flooring; living room with brick fireplace; separate dining room with sliding glass door to covered concrete patio; kitchen with laminate wood flooring and some updated appliances; spacious master bedroom suite with hardwood flooring, walk-in closet and ceramic tile master bath; two additional bedrooms on main level with hardwood flooring, double-door closets and hallway ceramic tile full bath with walk-in shower; lower level recreation room with second brick fireplace; HUGE storage area (great expansion potential) with utility/laundry area, three sets of full daylight windows, half bath and walk-up stairs to side yard; enjoy entertaining on the concrete patio in your private backyard; ideally located near Wildwood Shopping Center and Swim Club, and minutes from downtown Bethesda and Westfield Montgomery Mall. Extraordinary brick and stone front colonial with three-car garage built by NV Homes located in a private enclave of fourhomes sited on 3.32 pristine acres. The home features over 7,000 square feet of living area on three levels including: a great sense of light and spaciousness with 9-ft. ceilings on all three levels and a walk-out full daylight basement; custom painting, elaborate mouldings and custom window treatments throughout; elegant hardwood two-story foyer entrance with dual solid oak staircase; formal living and dining room with floor-to-ceiling windows and hardwood floors; dramatic two-story family room with built-ins flanking gas fireplace and windowed walls overlooking backyard; gourmet kitchen with 42-inch cherrycabinets, granite countertops, center island breakfast bar, upgraded GE appliances breakfast room/sunroom, beverage center, and walk-in pantry; main level study with Frieze carpet; main level mudroom with cherry built-in cabinets and front-load washer and dryer; generous master bedroom suite with tray ceiling and separate sitting area with cathedral ceiling and French door to private covered porch; opulent master bath with designer ceramic tile flooring, cherry and granite vanities, two-person Jacuzzi soaking tub, separate walk-in glass shower with dual showerheads, and enormous walk-in closet; three additional bedrooms on this level with designer ceramic tile baths; fully finished, daylight, walk-out lower level with recreation room, full-sized granite bar, bedroom, full designer ceramic tile bath, fitness room, game room and huge storage room. Outdoor entertainment paradise featuring Trex and vinyl deck with staircase, two-tiered paver patio, fire-pit, and covered lanai all overlooking panoramic scenic vistas. 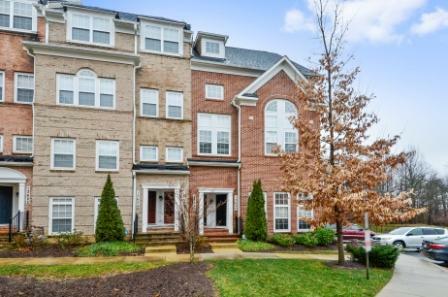 Regal 4BR/3.5BA end-unit 2-car garage townhouse in Rose Hill Falls built by The Magruder Companies BACKING TO CONSERVATION AREA. This showpiece home spans over 2,500 sq. ft. of living space on three levels and has been recently remodeled and renovated. Special features include: NEW custom painting; wide-plank hardwood, ceramic and marble flooring throughout; 9-ft., 10-ft., cathedral and vaulted ceilings; elaborate chair rail and crown moulding; NEW two-inch blinds; covered portico side entrance to marble two-story foyer; formal living room with custom built-in entertainment center flanking gas fireplace; step-up dining room separated by decorative columns; rare main level study with floor-to-ceiling bay window; REMODELED kitchen with granite countertops, ceramic tile backsplash, Subzero, Jenn-Air and Bosch appliances, granite island/breakfast bar with cooktop and NEWpendant lighting; breakfast nook with skylight; family room off kitchen with floor-to-ceiling stone wood-burning FP, recessed lighting, bay window and French door to expansive 12’ x 24’ deck; MBR with wide-plank hardwood flooring; vaulted ceiling, bay window, and enormous walk-in closet; master bath with NEW vanity in dressing area, skylight, Jacuzzi whirlpool tub, and separate ceramic tile shower with glass enclosure; two additional BR’s on upper level each with wide-plank hardwood flooring and vaulted ceilings; ceramic tile hall bathroom; walk-out lower level with recreation room or 4th BR, walk-in closet, full ceramic tile bath, and French door to brick paver patio and infinity back yard view of conservation area. NEW architectural shingle roof (2017). Be part of the vibrant Rockville Town Center featuring shopping, fine restaurants, sidewalk cafes, the new Rockville Regional Library, Regal Cinemas and other entertainment and cultural facilities. Immaculate and totally renovated, sun-filled, three-level 3BR/1.5BA townhouse with premium view overlooking open common area. Special design features include: NEW custom painting, NEWespresso wide-plank hardwood flooring, NEW designer porcelain tile flooring, neutral carpeting, NEW detailed mouldings and custom window treatments throughout. Foyer entrance to living room with hardwood flooring; dining room with hardwood flooring and NEW sliding glass door to deck; RENOVATED gourmet kitchen with NEW designer porcelain tile flooring, NEW espresso stained maple shaker cabinets, NEW granite countertops, NEW glass tile backsplash, NEW stainless appliances, and breakfast nook; RENOVATED powder room with designer granite tile floor and NEW granite vanity; MBR with walk-in closet, access to full bath, and bonus second closet; two additional upper level bedrooms with neutral carpet and closets; lower level recreation room with NEW porcelain tile flooring, NEW custom wainscoting, built-in bookshelf, NEW recessed lighting, and NEW sliding glass door to back yard. Neighborhood amenities include pool with swim team, tennis courts, community center, tot lots, Cedar Creek Park, and Kingsview Village Shopping Center retail and restaurants. 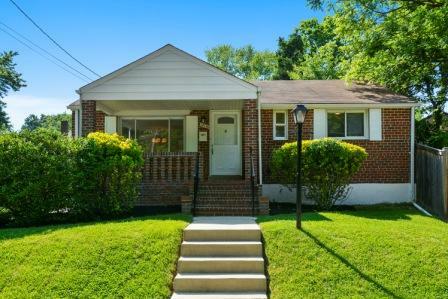 Charming 3BR/2FB all-brick rambler situated on a freshly landscaped premium corner lot with driveway. This property features approximately 2,200 sq. ft. of finished living space on two levels with special designer features including: refinished hardwood flooring on main level, custom painting, and updated light fixtures throughout. Inviting walkway leads to covered front porch; living and dining room with refinished hardwood flooring and lots of natural light; REMODELED kitchen with NEW flooring, maple cabinetry and Corian countertops; three spacious bedrooms on main level with refinished hardwood flooring and full ceramic tile bath; lower level recreation room features NEW carpeting, recessed lighting, full bath, and separate laundry/storage areas with access to side yard; expansive sunroom off of kitchen and fully fenced-in backyard perfect for entertaining. Wheaton Woods neighborhood features parks, pool and the Matthew Henson Trail. Ideal commuter location and close proximity to shopping, fine restaurants, and entertainment. 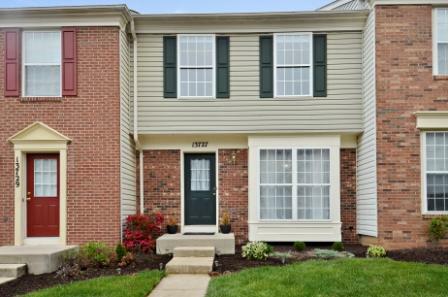 Designer 3BR (former 4BR)/3.5BA, two-car attached garage townhouse on quiet side street one half block from the neighborhood pool. This floor plan built by Stanley Martinfeatures approximately 3150 sq. ft. of living area on three levels including: 9-ft. ceilings on main and lower levels, gleaming hardwood floors on main and most of upper level, designer ceramic tile baths, custom painting, elegant mouldings, upgraded lighting and custom window treatments throughout. Foyer entrance with solid oak staircase, railing and painted balusters; formal living room and dining room with floor-to-ceiling windows, recessed lighting and wide solid oak staircase to upper level; gourmet kitchen with 42-inch maple cabinetry, granite countertops and granite tile backsplash, GE Profile appliances, breakfast bar center island and pantry; family room/breakfast room off of kitchen; back staircase and mudroom area with French door to private ceramic tile courtyard patio and rear access to garage; master bedroom suite with custom walk-in closet, sitting room with wall of windows, and luxury ceramic tiled Super bath with corner soaking tub and separate shower; two additional bedrooms with hardwood flooring on upper level combined to be one big room (can easily be converted back with installation of one wall); hardwood flooring in upper hallway with laundry center; fully finished lower level with recreation room, 4th bedroom, full bath, and storage room. Right in the heart of everything that King Farm has to offer...only a half block to the community pool, a few blocks to Mattie J.T. Stepanek Park, a few blocks to King Farm Village Center shopping, and steps to courtesy King Farm shuttle stop to Shady Grove Metro. 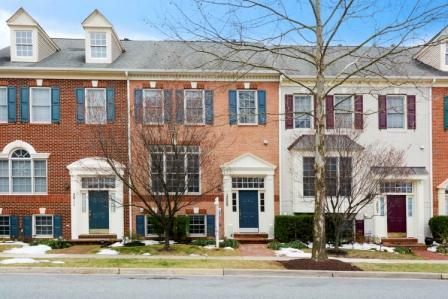 This impressive 4BR/4.5BA, brick-front colonial built by Pulte Homes features over 6,500 square feet of living area on three levels including: a great sense of light and spaciousness with 10-ft. ceilings on the main level, 8-ft. & 9-ft. on the upper level and 8.5-ft. in the walk-out daylight basement; elaborate mouldings & custom window treatments throughout; elegant hardwood two-story foyer entrance with solid oak staircase & wrought iron balusters; formal living room and dining room with hardwood floors and recessed lighting; main level study with hardwood floors and custom built-in bookshelves; family room with gas fireplace and windowed walls; gourmet kitchen with cherry cabinets, center island, breakfast bar; upgraded GE Profile stainless steel appliances, designer slate tile flooring, breakfast area, workstation area, and granite butler’s pantry; glorious morning room with double French sliders to deck with stairs to rear yard; generous master bedroom suite with tray ceiling, step-up sitting room with two-way gas fireplace surrounded by custom built-ins; luxurious master bath with designer ceramic tile flooring, two way gas fireplace two-person whirlpool tub; separate glass shower, and enormous walk-in closet; three additional bedrooms on this level with two full designer ceramic tile baths; upstairs laundry room; fully-finished walk-out lower level with recreation room, full-sized bar room, fitness room, full designer ceramic tile bath, and huge storage room. 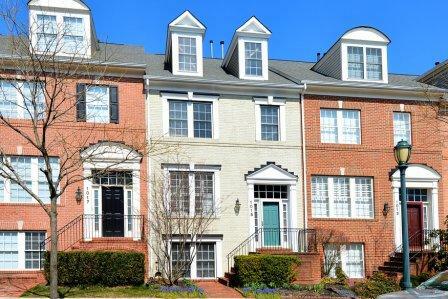 Dramatic 3BR/3.5BA, two-car detached garage townhouse on quiet side street overlooking Mattie J.T. Stepanek Park. This floor plan built by Churchill features approx. 2700 sq. ft. of living area on three levels including: 9-ft. ceilings and gleaming hardwood floors on main level, custom painting, elegant mouldings, upgraded lighting and NEW window treatments throughout. Two-story foyer entrance with hardwood flooring and oak staircase with oak railing and painted balusters; formal living room with floor-to-ceiling windows; separate dining room open to living room; gourmet kitchen with 12-inch designer ceramic tile flooring, 42-inch maple cabinetry, Corian countertops and glass tile backsplash, NEWERWhirlpool stainless appliances, center island and pantry closet; family room off of kitchen with NEW French door to redone decking and fully fenced-in backyard; master bedroom suite with vaulted ceiling, two walk-in closets and NEWLY REMODELED designer ceramic tiled bath with whirlpool tub and separate shower; two additional bedrooms on upper level. Fully finished lower level with recreation room, den/4th bedroom, full bath and separate laundry room with NEW HVAC and hot water heater. Right in the heart of everything that King Farm has to offer...only a few blocks to the community pool and Mattie J.T. Stepanek Park, a few blocks to King Farm Village Center shopping, and steps to courtesy King Farm shuttle stop to Shady Grove Metro. Stately brick-front 5BR/3.5BA colonial with two-car garage in Quince Orchard Estates.This home features approximately 4,450 square feet of living area on three levels including: a great sense of light and spaciousness with 9-ft. & 10-ft. ceilings on the main level; designer home appeal with custom painting throughout, hardwood floors, designer carpeting, and elaborate mouldings throughout; two-story foyer entrance flows into study; formal living room opening to formal dining room both with box window bump outs; RENOVATED gourmet kitchen with 42-inch cherry cabinets, center island/breakfast bar, beverage center, and breakfast room with sliding glass door to expansive deck; adjacent step-down family room with 10-ft. ceiling, wood-burning brick fireplace, and two sets of French doors to deck; master bedroom suite with vaulted ceiling, skylight and walk-in closet; master bath with Jacuzzi whirlpool tub and separate shower; FOUR additional bedrooms all on the same upper level with full bathroom in the hall; lower level recreation room with NEW wall to wall carpeting, recessed lighting, wet bar, and game room area; office/den with wood-like laminate floors, recessed lighting and full bathroom; second laundry facilities in storage room. NEW roof and newer HVAC & water heater. Professionally manicured landscape with specimen trees and shrubs, deck, brick patio, and hot tub with privacy fence. 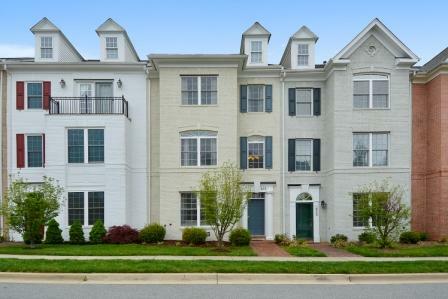 Spectacular 3BR/3.5BA end unit built by Winchester Homes backing to tree-lined common area. Approximately 2,550 sq. ft. of living area on three levels plus a two-car garage just minutes from Metro’s Red Line. Upgrades galore including: 9-foot, vaulted & cathedral ceilings; maple hardwood flooring on entire main level; custom painting & window treatments throughout. Side-entry to foyer with hardwood flooring; gourmet remodeled kitchen with 42-inch maple cabinets, NEWgranite countertops, NEW upgraded stainless appliances, and NEW granite island/breakfast bar; glorious sunroom/breakfast room with French doors to deck and private fenced rear yard; family room off of kitchen with hardwood flooring; separate maple butler’s pantry with NEW granite wet bar leads to formal living room and dining room; MBR with cathedral ceiling, sitting room & remodeled Super bath with designer ceramic tile, two-person Jacuzzi soaking tub, and separate shower; lower level recreation room with corner gas FP; separate den or possible 4th bedroom and full ceramic tile bath. Be part of the newly designed, vibrant Rockville Town Center featuring shopping, fine restaurants, sidewalk cafes, the new Rockville Regional Library, Regal Cinemas and other entertainment and cultural facilities. 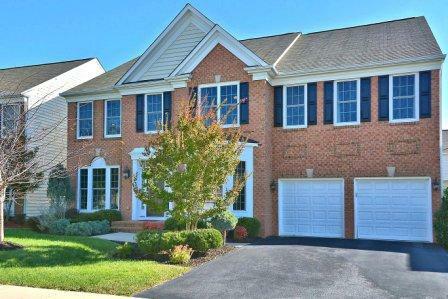 Stunning 3BR/3.5BA one-car garage townhouse located in the desirable community of Ashlawn Ridge. This showpiece home spans approximately 2,300 sq. ft. of living space on four levels and has been recently remodeled and renovated. Special features include: hardwood flooring, custom painting, updated light fixtures and window treatments throughout; 9-ft, cathedral and vaulted ceilings; elaborate chair rail and crown moulding; inviting foyer entrance with 11-ft. ceiling leads into formal living room with box/bay window and separate dining room; REMODELED gourmet kitchen with ceramic tile flooring, granite countertops, tile backsplash, stainless steel appliances, granite island/breakfast bar with downdraft cooktop, recessed lighting and access to deck; breakfast area with wall of windows overlooking deck; MBR suite with cathedral ceiling, two walk-in closets and staircase to LOFT with gas fireplace and built-ins bookcases; luxury REMODELED master bath with double French door entry, vaulted ceiling, vanity with dual sinks and granite countertops, jetted tub, and separate walk-in ceramic tile shower with glass enclosure; two additional bedrooms on upper level with a fully RENOVATED ceramic tile hall bathroom; walk-out lower level recreation room with laminate wood-look flooring, gas fireplace, full ceramic tile bath, and sliding glass door to second deck with enclosed back yard and lawn. Be part of the vibrant Falls Church area featuring shopping, fine restaurants and short commuting access to DC and Metro. 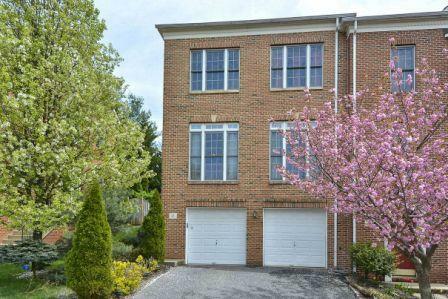 Immaculate sun-filled two-level end unit 2BR/2.5 BA townhouse/condominium with one-car attached garage. BONUS side windows compared to interior units and premium view overlooking open area. Special design features include: custom painting, 9-ft. and 11-ft. ceilings, hardwood flooring, designer ceramic tile flooring, neutral frieze carpeting, detailed mouldings and custom blinds throughout. Foyer entrance to step-down living room with hardwood flooring and walls of floor-to-ceiling windows; dining room with hardwood flooring and box window; gourmet cherry and granite kitchen with breakfast bar, walk-in pantry, recessed lighting and designer ceramic tile flooring and backsplash; powder room with pedestal sink; MBR suite with BONUS side windows, sliding glass door to rear deck; walk-in closet, bonus second closet, and luxury full designer ceramic tile bath with dual cherry & granite vanities, corner soaking tub, and separate walk-in shower; additional upper level bedroom with sliding glass door to rear deck; second full bath and laundry center in hallway. Neighborhood amenities including pool and community center with fitness room and conference room. Be part of the Germantown Town Center featuring a vibrant combination of newly designed mixed use office, shopping, restaurants, entertainment and cultural facilities as well as the MARC train. Welcome to this stately, custom-built colonial exquisitely sited on a gorgeous .95 premium acre lot with breathtaking views spanning the Frederick City skyline. Built in 1988, this 6BR/3FB/1HB masterpiece with two-car side-load garage was constructed with only the finest quality construction materials. This residence offers approximately 9,000 sq. ft. of living space on three levels designed for large family living and entertaining. Special features include a great sense of light & spaciousness with versatile floorplan, hardwood flooring and NEW carpet throughout. Arched brick front porch entrance leads into inviting two-story foyer; double French doors flanking foyer leads both into the separate living and dining rooms; dramatic great room with high ceilings, floor-to-ceiling windows and brick wood burning fireplace, overlook from loft, and access to wrap around porch; kitchen with endless possibilities, two islands, butlers and walk-in pantry areas; breakfast area with double French doors to screened-in porch; laundry room off kitchen with built-in work areas; main level master bedroom suite with two double-door closets and full bath; upper level second master bedroom suite with sitting area and his and hers walk-in closets and full bath; three additional bedrooms upstairs all with walk-in closets, sixth bedroom/office and full bath; loft area with overlook to great room and foyer; lower level features recreation room with ample storage, two other rooms ideal for guests, office, craft or theater rooms and separate utility room with cellar access to backyard. Relax, sit and enjoy the stunning views on either your screened-in or wrap-around porches. Ideal backyard to create your on private oasis. Conveniently located to downtown Historic Frederick and the all the shopping, restaurants and amenities the city has to offer. Rare 5BR/4.5BA Victorian with two full-sized master bedroom suites (one on the main level and one on the upper level), an old-fashioned front porch, and a two-car garage. Great location across from quaint pocket park, one block from the Mattie J.T. Stepanek park, one block from KF shuttle stop to Metro, and a few blocks from the community pool. The floor plan boasts over 4,250square feet of living space on three levels including: a great sense of light and spaciousness with 9-ft and two story ceilings; designer-home décor with sophisticated custom painting, hardwood floors, elaborate mouldings, and window treatments throughout; two-story foyer entrance opens to formal living room with wood burning fireplace and separate dining room; gourmet table-sized kitchen with NEW 16-inch Dura Ceramic flooring, NEW granite countertops, subway tile backsplash and NEW stainless Whirlpool appliances; main level master bedroom suite and designer ceramic tile bath with Kohler soaking tub and separate shower; mudroom from garage; unique upper level family room with two-sided gas fireplace, recessed lighting and overlook to kitchen; generous upper level master bedroom suite with huge walk-in closet and luxurious Super bath with Kohler soaking tub and separate shower; two additional bedrooms on this level with full designer ceramic tile bath; fully-finished lower level with recreation room, den, 5th bedroom, and full bath.